I've heard new & seasoned teachers talk about the problems they have with students copying their examples. This is a normal "issue", but there are ways to curb students desire to copy cat. I create teacher examples during demo, but as I'm working....I let them know they are not allowed to create what I'm creating. It is often met with...."BUT I WAS ALREADY PLANNING ON DOING THAT!!!" I just simply say..."I'm sorry, but you cannot create what I'm creating. I'm sure you will come up with an amazing idea all on your own!" 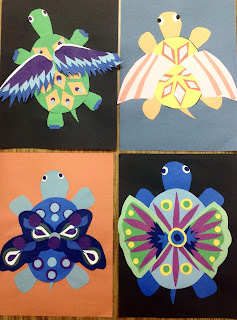 During the Mixed Up Create/Animal Collage I did with 1st grade this week...I made it clear that no one was allowed to create a flying turtle! Each day that I demo the project...I create a flying turtle(but in a variety of ways). If you are consistent with your expectations...they will know right away what you want from them! If they are "stuck" on your idea...then you need to encourage them to take it in a totally different direction. This isn't hard to do, but will take you having a conversation with them. Ask them what things they like, what are they good at drawing, or things they felt successful with in the past. Encourage them to take those ideas, and create something new and wonderful! Don't accept a copy of your work...they need to be independent thinkers & artists!! !